This form is for those who need to let the company know their current designation/salary and their changed designation or salary. This has to be filled up and signed by both the employee and the manager. You have to provide information like job information, status of employment, salary, reason of change and information on leave if required. 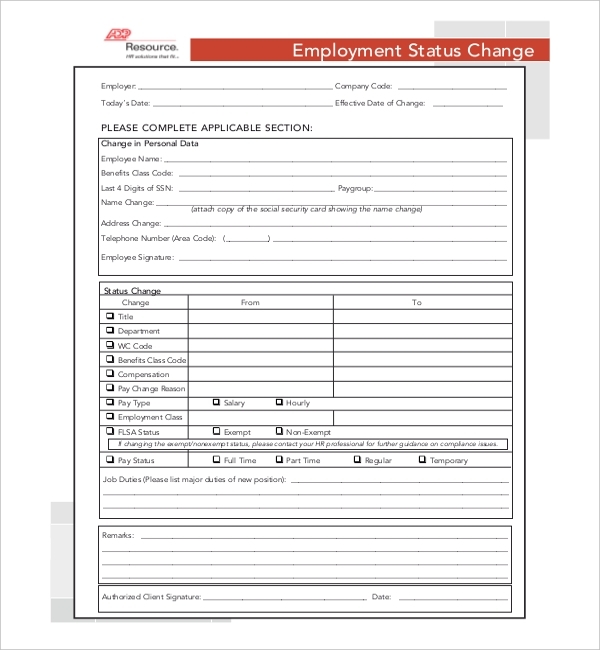 The employee status change form is available in the word format. This form is easily downloaded and filled up. 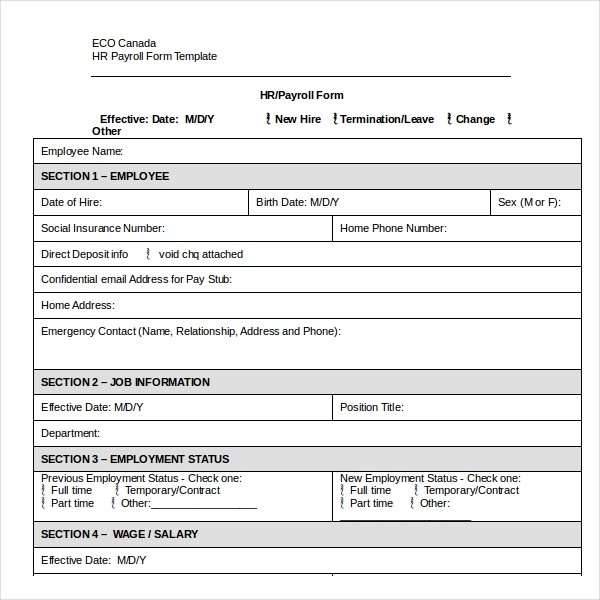 The form is important for company/business records. This form must be signed duly and given to the head person soon. 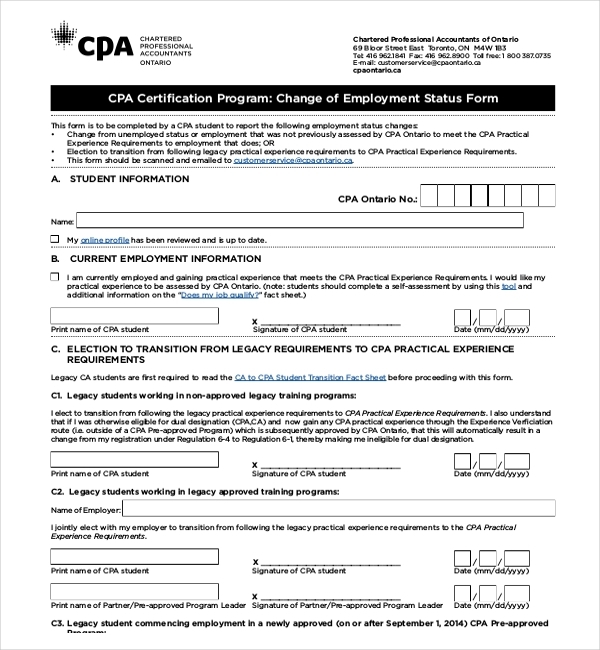 This form is for Chartered Professional Accountants of Ontario. There is a space for student information and current employment and other required fields are to be filled up in due time. This form can be directly filled online after download. You can print and sign these and send it to the person required. 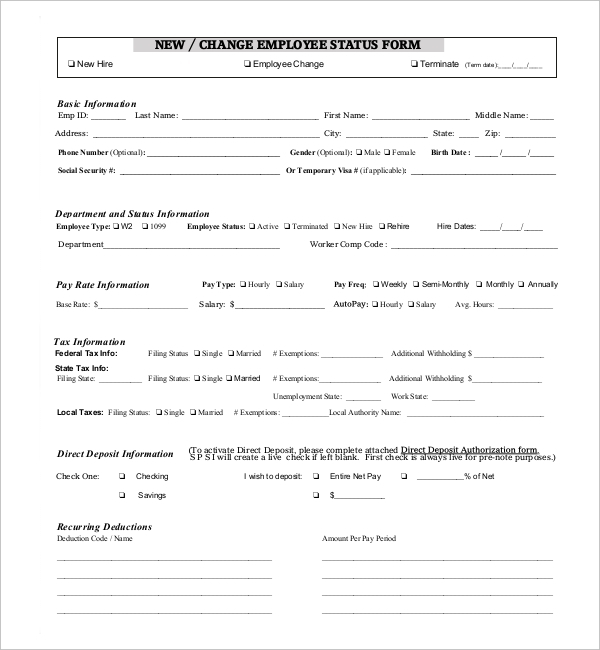 ADP Employee Status Change Form The necessary changes are to be filled in in this form whether it’s about salary, name, address change, contact number change, pay status change such as full-time, part time, temporary or regular employee or status change. The signature of the person in question is required along with the client signature and should be duly submitted. This is a very small and easy form to fill-up given under California Unemployment Insurance code. 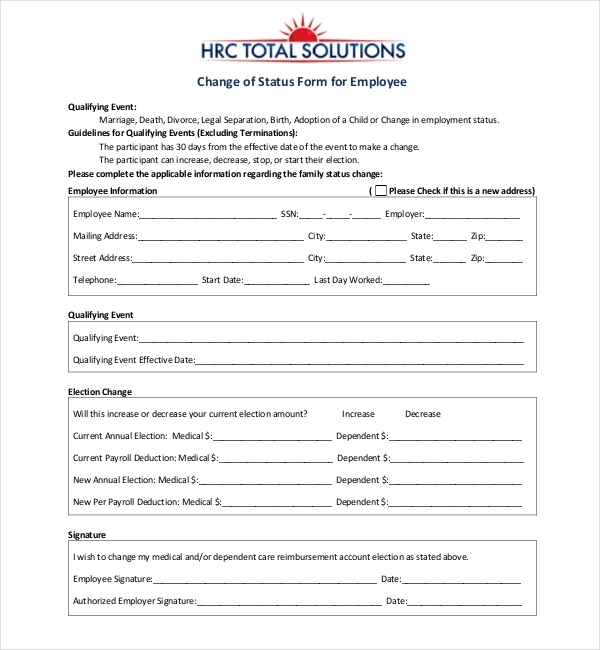 The employee simply needs to mention the change of status in employment and signed correctly. 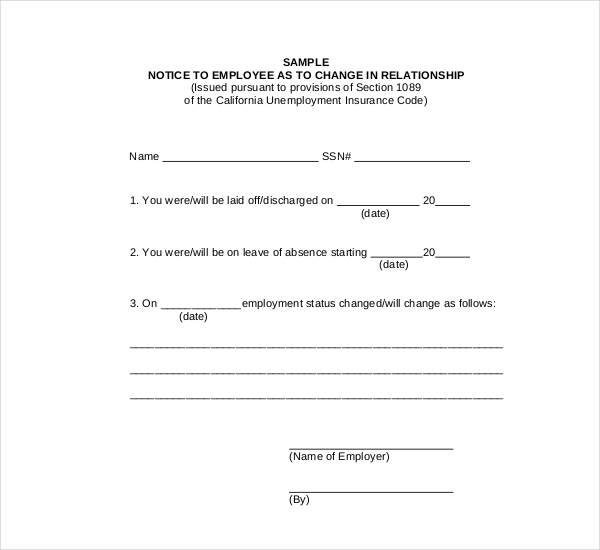 Any change in the relationship is to be filled in this form and send it to the person required. An employment status form is required in every field in cases where there has been any form of change from the employee’s side. 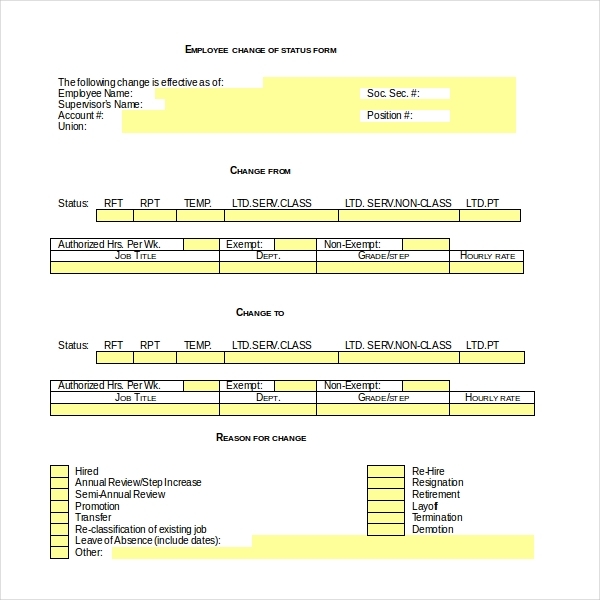 The person has to fill in basic information whether they are new, changed or terminated. Tax information, direct information, pay rate, and recurring deduction are to be filled up. A worker would have to fill this form with their correct information. They have to fill the election change field, qualifying event etc. this form needs to be signed by an authorized employer. The qualifying event to fill this form can be divorce, death, marriage, adoption, separation or change in employment status. The form is for filling out the change status for each benefit election change requested. They are mentioned at the end of the form. The different codes are written for the person’s help. This form has code numbers for various change requests. The employee must search for the appropriate number and fill it in, in the right place. There are 30 codes from you can chose one and accept as change election. The employer must write down the appropriate information and sign it accordingly. These employee status changes can be for the employees benefit. A person choosing to work at will have the power to quit and change jobs any time they want. They can also be fired at any time for any time that is not illegal. These methods are available in USA. 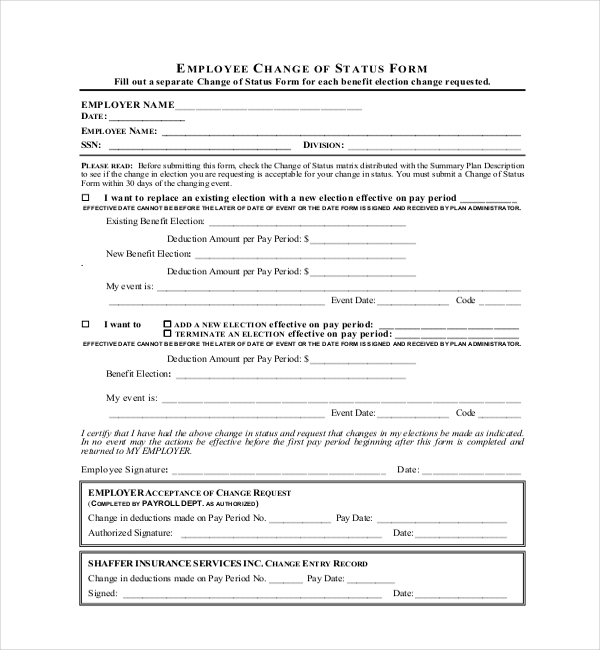 Hiring purposes, benefits, demotion, pay rate change, promotion, transfer, leave of absence, paid leave for absence, retirement, termination, return from leave, marriage, adoption, divorce, data change, hiring etc. the forms are based on hiring new employees, edit existing jobs, change employees status etc. Any rights that a worker has under a contract employment, such as insurance for medical purposes, for instance, are in addition to the rights the employee has in the law. Legal rights include the right to minimum wage; the right has paid holidays for most of the people and the obligation to enroll in a pension scheme. The employee and the employer can agree on the terms the employee wants but certain changes seeking to limit the legal rights can be ineffective. For example, an agreement to be paid less than the minimum salary will be considered as ineffective. There are three types of employment status – employee, worker or self-employed. The worker would get a minimum employment rights and is entitled to maternity leave and sick pay. An employee is a worker who has more than just basic rights to employment and more additional responsibilities than the worker. You will likely have an employment contract and the employer is entitled to tell you when to come and where to report. If you yourself decide to have your own timing and work ethics, make your own leave, agreements, pay the taxes themselves and National insurance, then you will come under the self-employed category. A self-employed person themselves deals with the customers or the clients. Persons in this category have a contract of their own service. Make sure all the information that is put in the form is completely correct and true to nature. False information is strictly prohibited and can lead to ugly situations. The person filling the form must have original documents if required. This is for verification purpose and is mandatory in many levels. If the documents are not present, the process may have to be in a standstill. The manager or supervisor must sign the form to ensure that it is checked. These forms are important for the company and hence need to be verified properly before the next step is taken. Be sure that all the forms are understood and filled in properly. If there are any queries they must be asked to the respective person responsible in handling these forms. It’s always better to ask about any confusion than to welcome unwanted scenario in the future. Specific reasons are to be written down in the form. Invalid ones may not be passed by the employer or the manager. All forms are important in a workplace. They are entitled to do so as it is a legal procedure. These forms are signed by both the parties and submitted duly. Try our website for a well-tailored which is easy to fill.